November 2002. May McCulloch (nee Mullen), Glasgow, Scotland. sent in this class photograph. She stayed at 246 Dunn Street as a child. ( webmaster: May is my mother's cousin ). 5 Arthur Hall 2. Daniel ? Hi, I have just been on to your website and I discovered an old photograph to my amazment I happen to be in the photograph brought back lots of old memories. The photograph is in the year 1951(8years). I attended your Dalmarnock school until I went to John street school. 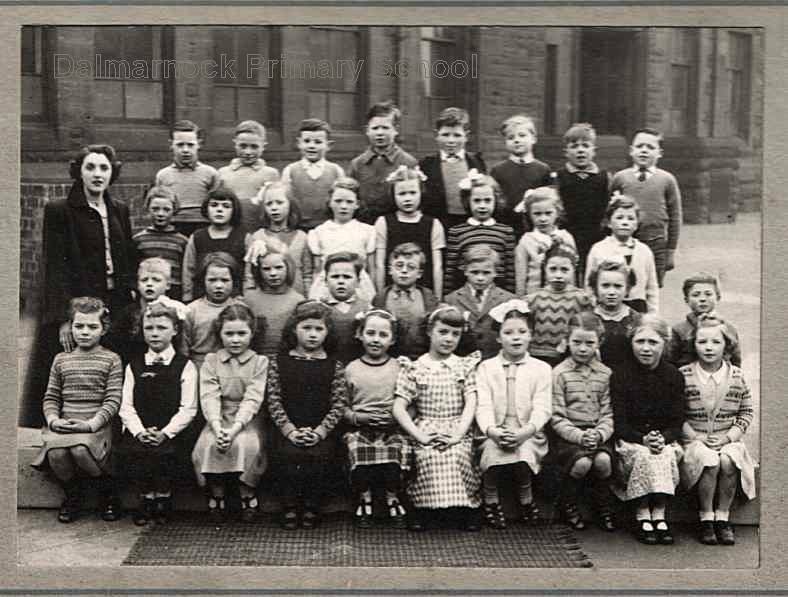 My name then was Phyllis Wolfenden and I am sitting at the very frontrow no1 I think the girl in the same row 3rd is called Charlotte Thomson. I also think the girl3rd row up third from right is Gertrude Nelson I hope this is some use to you if I remember any more i will let you know. I now live in Carluke lanarkshire and I have three children and four grandchildren I have now retired from my work and have been just recently widowed. I think your site is great I lived at 54 Ruby Street, dalmarnock next door to the steamie where my mother spent most of her time and the tram depot was across the road. We moved from there to Drumchapel. Dear Webmaster, I have just came across your site and enjoyed reading through it. I have looked at class of 8 year olds photo from 1951, and believe I can name most of the pupils and the teacher. BACK ROW [left to right] Samuel Lamont, Daniel ?, Andrew McAlister, David Knowles, Arthur Hall, William McSorley , David Currie, William Stevenson. Victoria Taylor, Mary Hall, Margaret Knox, Rita McMillan. Maureen Shearer, Ann Hardie, Janet Whitelaw,Helen Mulhearn, Betty McIntyre, Mary Ballantyne.